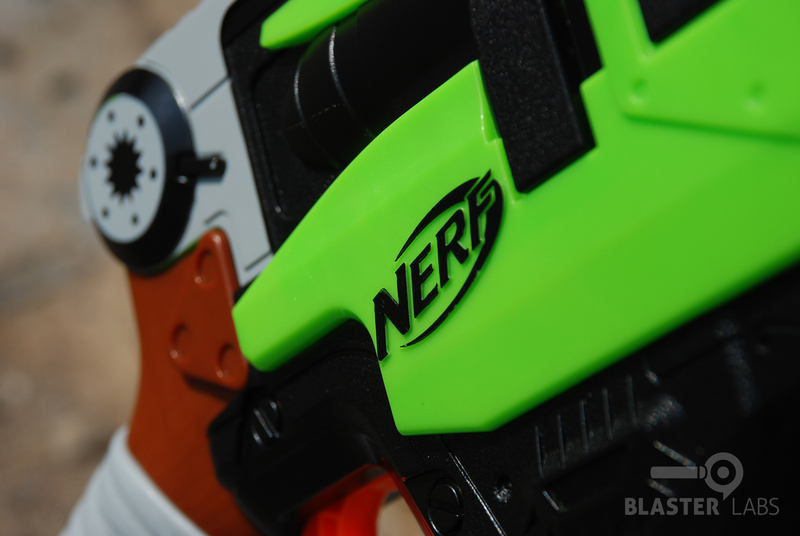 Along with the newly released Nerf Elite Demolisher 2-in-1, the Nerf Zombie Strike Slingfire is undoubtedly one of this year’s most highly sought-after new blasters from Hasbro. Ever since we first laid eyes on the flipping, spinning lever-action reload, we just knew this one would be a crowd-pleaser. But now that the Slingfire is out in the wild, the reality of its design hits home. 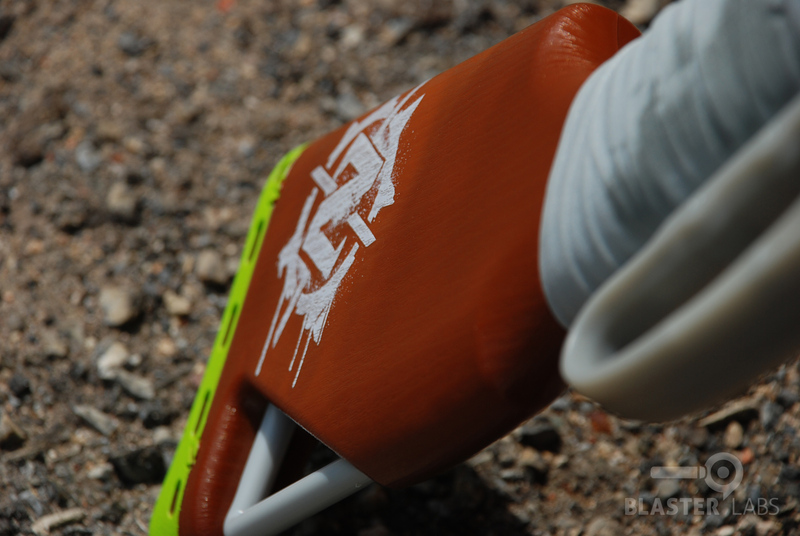 Can a cool-looking blaster with a unique reloading action cut-it when it comes to anything beyond just looking good? 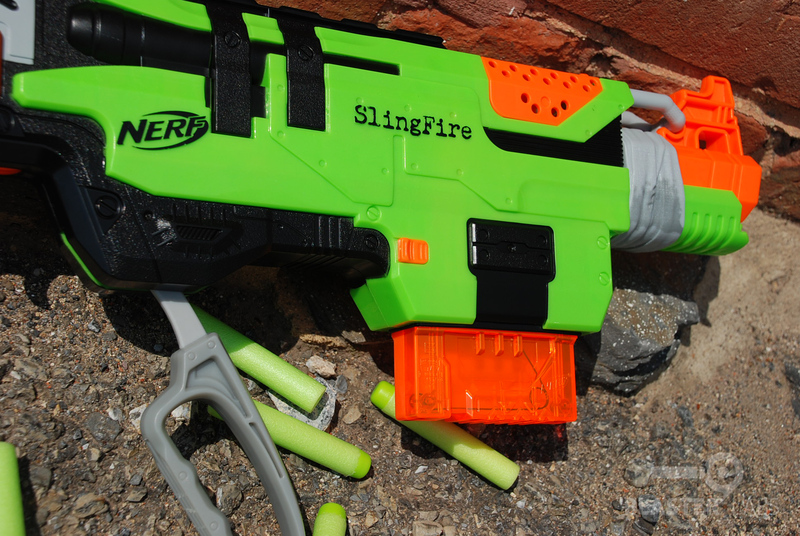 Is the flashy Slingfire built to be something more than a stylish flash in the pan? 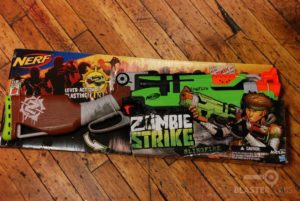 The Nerf Zombie Strike Slingfire comes in the now-familiar Zombie Strike packaging that exposes a large portion of the blaster for buyers to glimpse the actual product on the shelf. 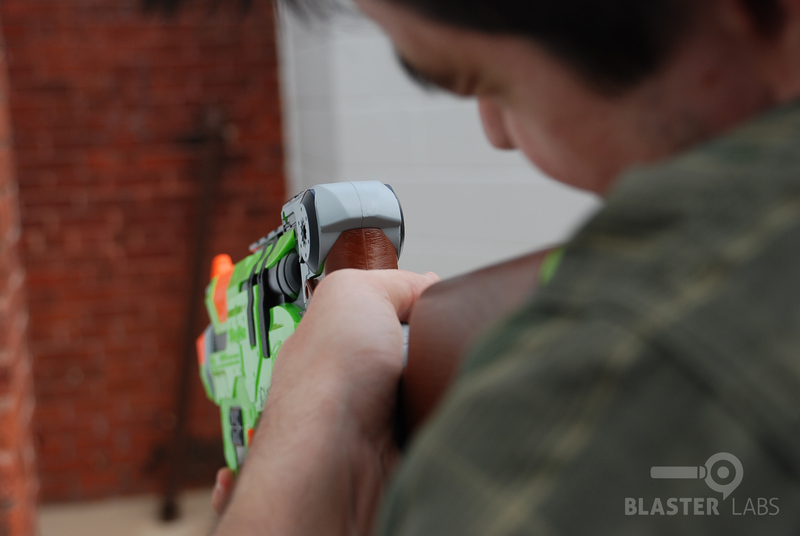 And what they see is sure to please–the Slingfire looks like little else on the blaster market today, with a sawed-off, lever-action, post-apocalyptic vibe that fits right in with the current pop culture zombie craze. The box graphics are a pleasing mix of Zombie horror-light combined with fun, anime-esque character design. 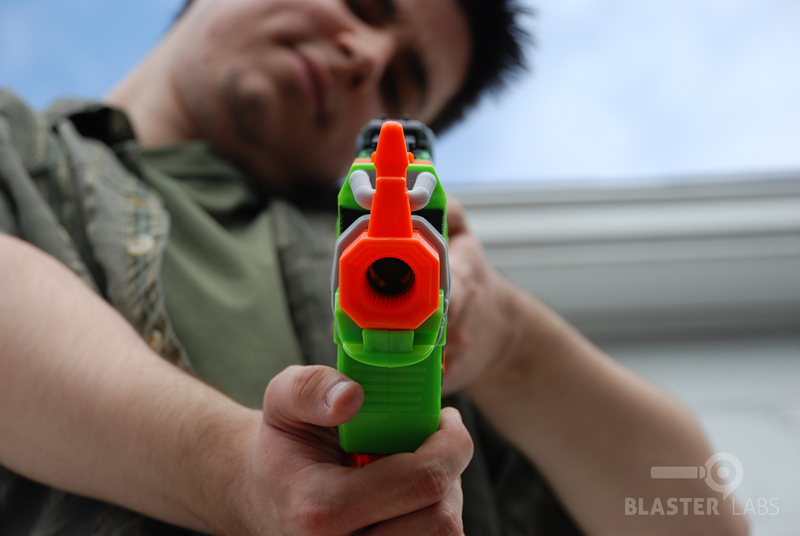 If the target market is teenage and young-adult males, Nerf hit this one right on the mark. While the Slingfire hits all the right notes with packaging design and branding, it’s leading a virtual chorus when it comes to the blaster’s industrial design. 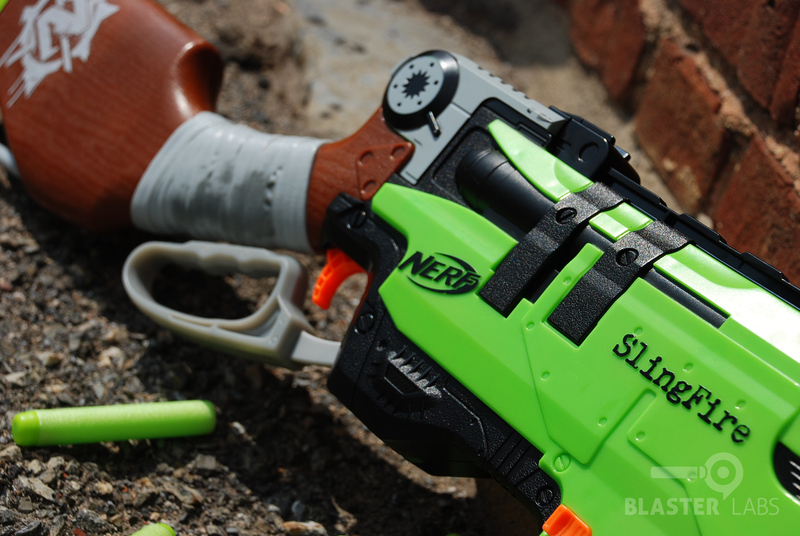 We counted no less than 7 different shades of plastic and/or paint colors used to create the Slingfire’s unique look, and unlike many blasters (including some from Nerf), it actually looks good on both sides. In addition, there are numerous textures and molds that really help bring the “zombie wasteland” feel to life. 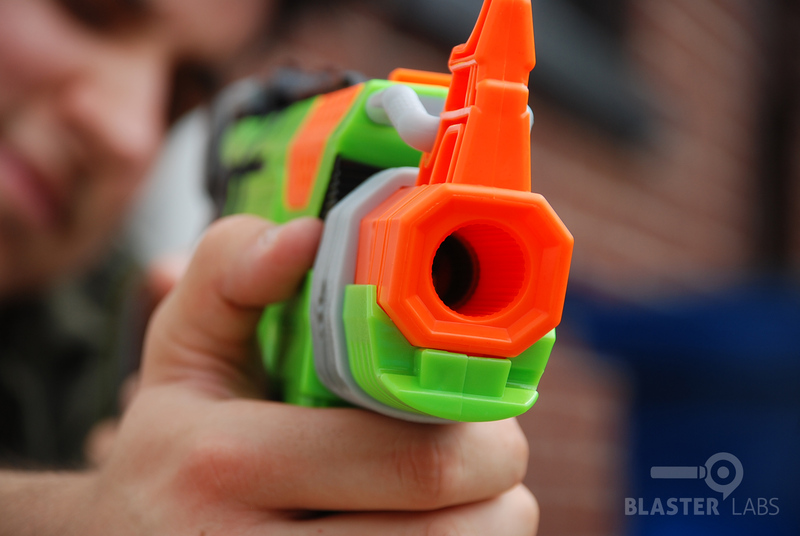 These somewhat disparate elements are put together to a higher standard than we’ve seen from competing products–or even most of Nerf’s own products. 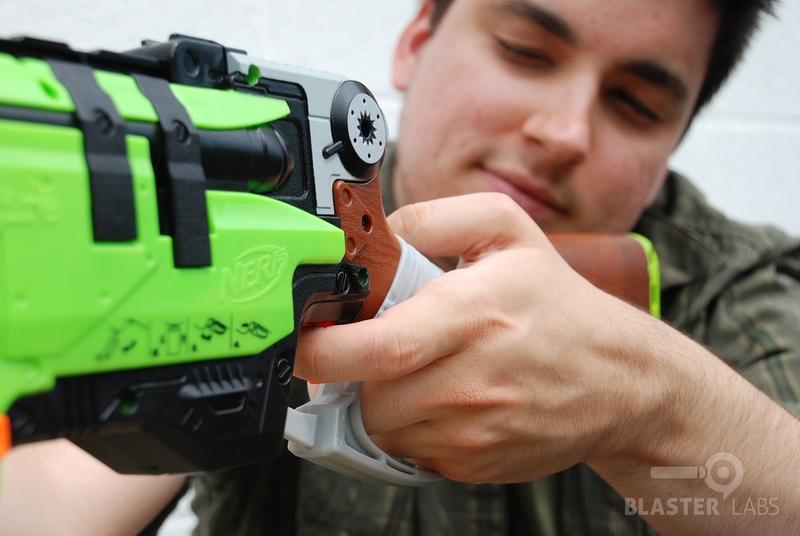 Although it may not be evident at first, it’s clear that the designers at Hasbro put some thought into this blaster’s aesthetic components, and it really helps bring the zombie blasting fantasy that much closer to reality. Yes, there may have been some inspiration taken from the nearly decade-old Buzz Bee Rapid Fire Tek lever-action rifle, but the Slingfire looks much less like a toy than that model, and more like something hand-built for use as a movie prop. This is really one of the better-looking, more interesting designs we’ve seen in a long time. 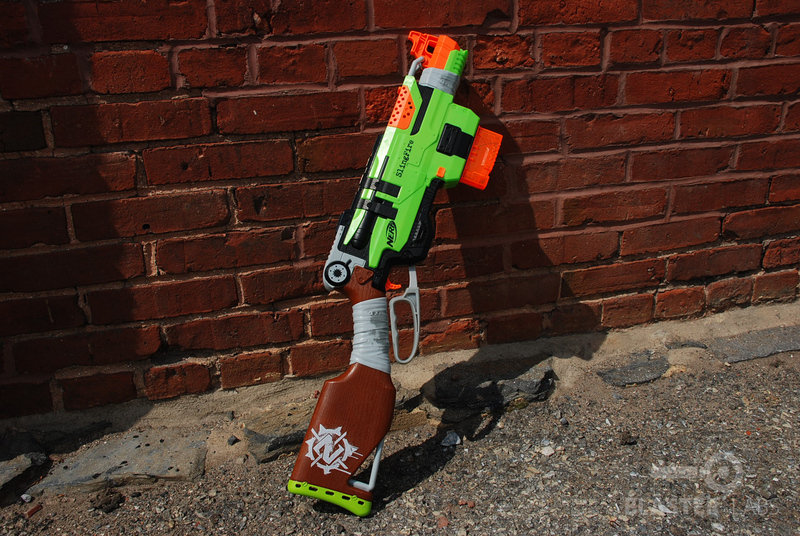 Ergonomically, the Zombie Strike Slingfire has a pleasingly lightweight feel, with an overall size that is neither too big, nor too small. The trigger area is free from obstructions, the built-in iron sights are adequate, there’s a single tactical rail up-top, and strap mounting points are present (but limited to just two). 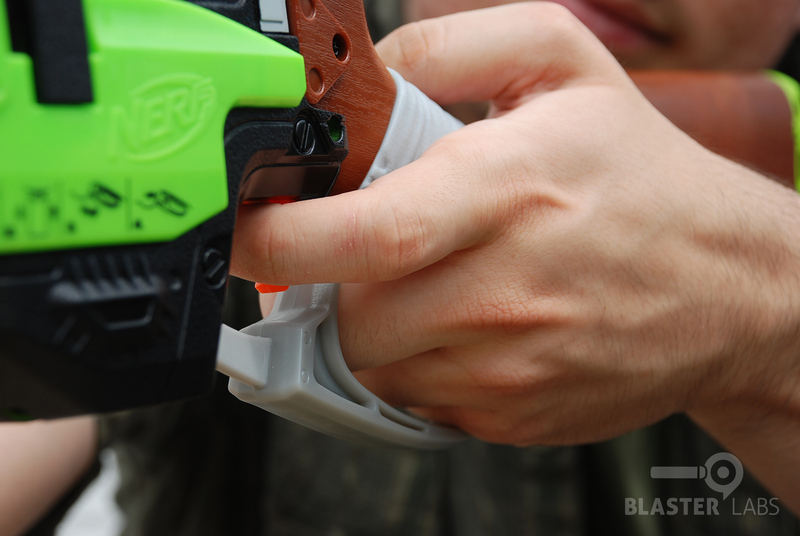 We also found that the handle grip falls right to hand, as one would expect from a Nerf product, and it’s easy to hold the blaster with either one hand or two. We expect all but very young children should be able to hold the Slingfire, though the lever-action priming will be tricky for smaller users. 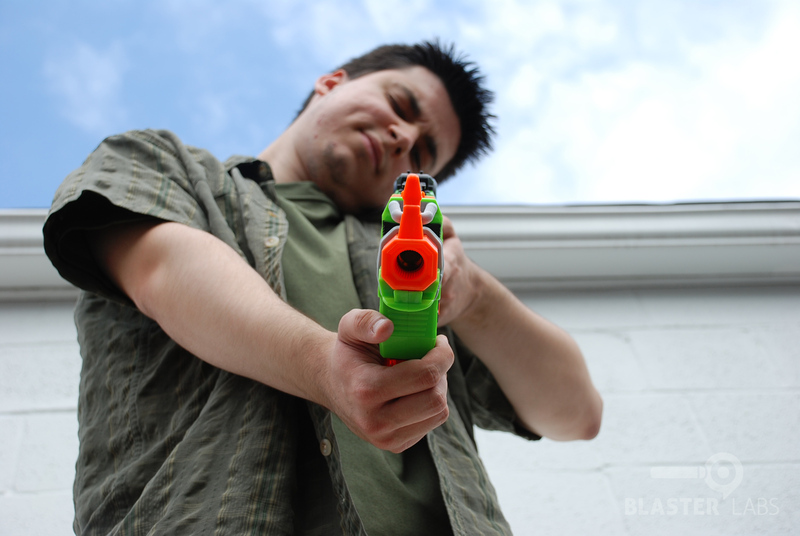 This firing preparation requires the lever to be ratcheted forward of the trigger to a point just past perpendicular with the blaster body until a more distinct “click” is heard and a stronger resistance is felt. 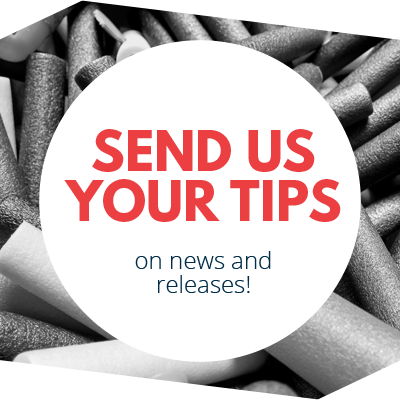 One other quick note–the clip remains locked and will not release unless the priming lever is fully forward and the clip release tab is depressed. This is kind of an odd design decision, since the instruction manual encourages the user not to leave the Slingfire primed when not in use, but in order to load the clip back into the blaster, the lever has to be moved such that the Slingfire is then primed. So you have to leave the Slingfire in a “minus one” dart scenario in order to keep from leaving it primed. Speaking of which, the Slingfire’s party trick is, of course, that lever-action priming mechanism, which is almost as sweet as it sounds. 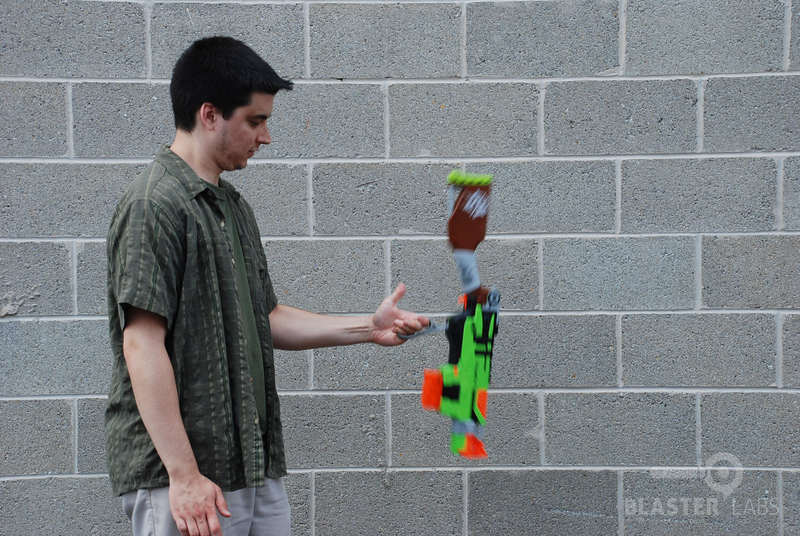 On our Slingfire, the action was a little stiff, such that some members of our team weren’t able to pull-off the “swing to prime” action seen at Toy Fair and other events. Still, with a little practice, some of us were swinging and cocking with reasonable success, and could probably even dual-wield with enough practice. 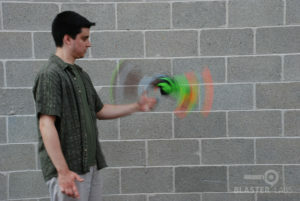 It’s definitely fun, and it looks awesome. Is it practical? Well, not entirely, but it’s so enjoyable you’ll likely forget about that… at least initially. 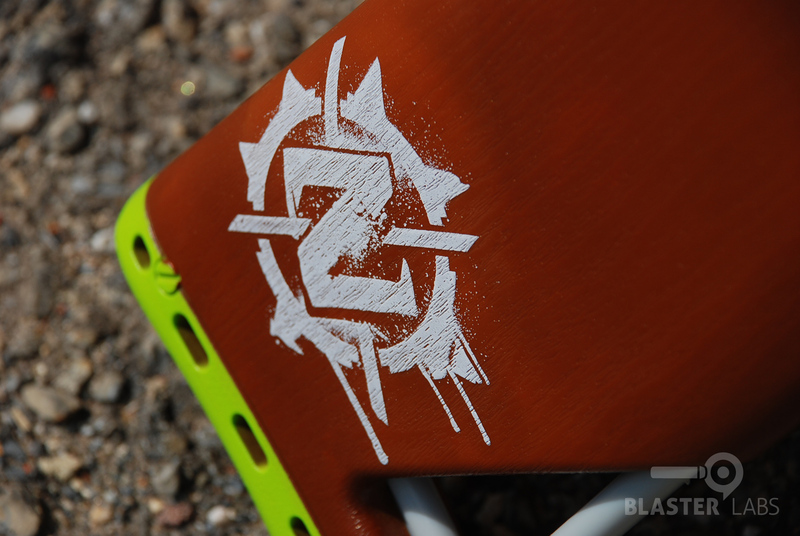 Although it’s not stated anywhere on the Zombie Strike Slingfire packaging, early press releases indicated that the Slingfire would be capable of standard, 75-foot Elite ranges. 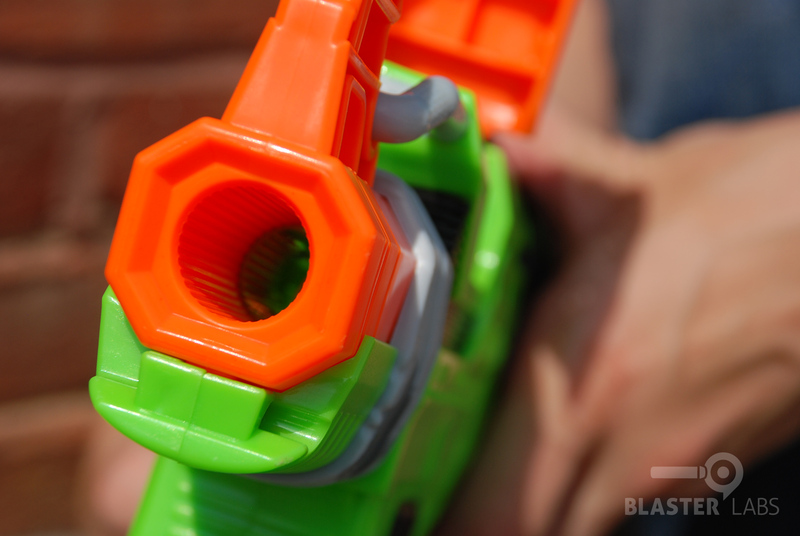 Of course, those who have read our reviews of past Nerf Elite products will no doubt be aware that we are often incapable of reaching Hasbro’s distance claims, regardless of angle, dart condition, or phase of the moon. The same was found to be true, here… and unfortunately, that wasn’t the only issue. Using brand new, Zombie Strike darts packaged with the Slingfire (of which you get six to place in the small, standard clip), we were able to hit a maximum distance of 63 feet. We test in a fully enclosed, climate-controlled environment of approximately 115 feet in length, so no outside variables were present. Most darts reached distances of slightly less than the low 60-foot range, but few were complete duds, either. Consider us unimpressed, but not exactly surprised. Turning to our Competition Electronics Pro Chrono with indoor lighting kit, we measured an average dart speed of 64 feet-per-second at a distance of approximately 1 foot, and using a mix of new or nearly new darts. Our lowest speed was 61 FPS, with 66 FPS being our highest, indicating relatively good consistency. Turning to rate-of-fire, with the unique, lever-action priming, we were able to do no better than 1.5 darts per second. Our initial tests were a bit slower, but over time, this proved to be the maximum we were capable of achieving. Making matters a bit worse than sub-part distance, and slow rates-of-fire, it’s been awhile since we’ve experienced shot accuracy that was as poor as what we experienced with the Slingfire. It was almost comically bad how darts would veer strongly left one time, strongly right the next time, and then almost dead straight the next. There was no rhyme or reason that we could detect, since there were no environmental factor present, and we only used brand new darts that were not damaged in any way that we could detect. So we’ll go one further to say that despite all of the controversy surrounding the BOOMco product launch and their proprietary “Smart Stick” ecosystem and non-compatible darts, Mattel has at least recognized the limitations of foam darts–their new plastic-bodied darts are simply more accurate than most foam darts at long distances, Smart Stick or not (and whether we like it or not). So, the Slingfire is no barn-burner when it comes to performance. In fact, it’s decidedly average… below average, even. And early reports on Reddit suggest we’re not the only ones to experience a little bit of buyer’s remorse when it comes to the Slingfire delivering on the capabilities implied by its awesome industrial design. Could it be that early production models don’t have all the kinks worked out? We have no indication that anything was amiss with our sample, though in fairness, we currently only have one unit on-hand to test. So for now, we have to tell it like it is–the Slingfire is simply not a stellar performer, at least in our experience to-date. 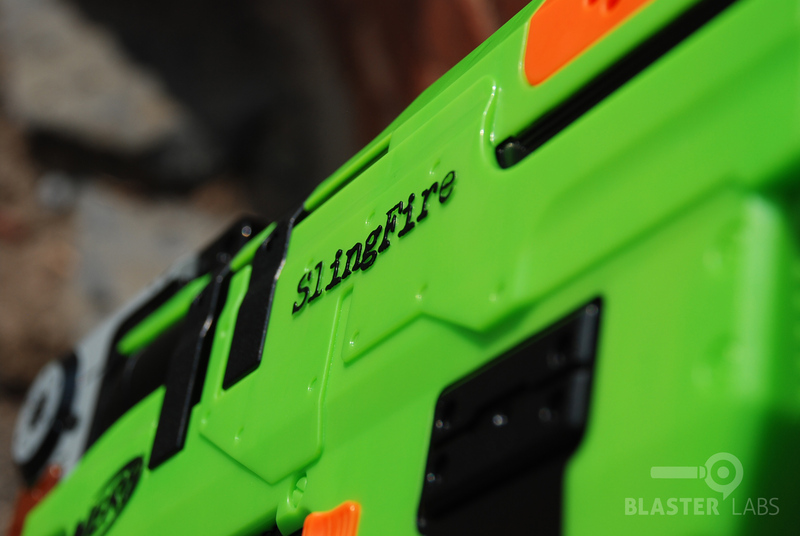 The Slingfire, like virtually all recent Nerf products, is built extremely well and is clearly made of quality materials. 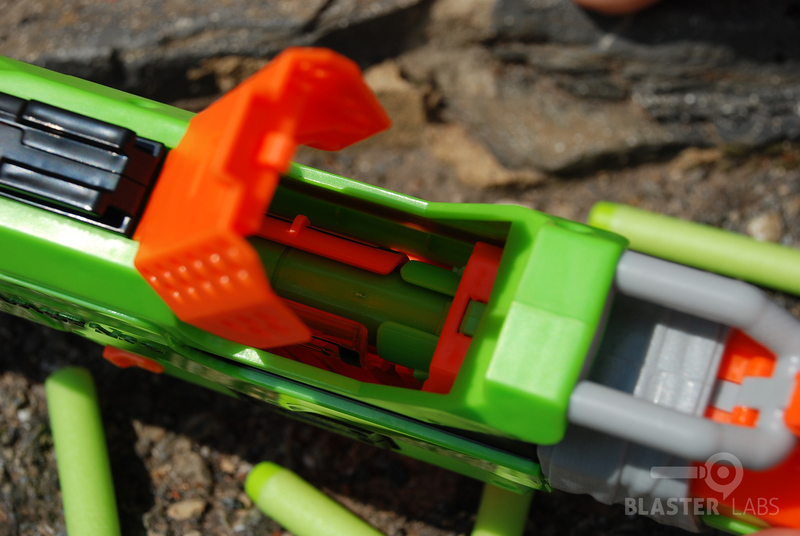 Hasbro continues to set the pace when it comes to building a quality toy blaster with impressive engineering, refined industrial design, and durable build quality. And the Slingfire is a prime example of all of those traits, bar none. In fact, for the money, we’d say it almost has no equal. And no, you don’t need to worry about the lever handle breaking. 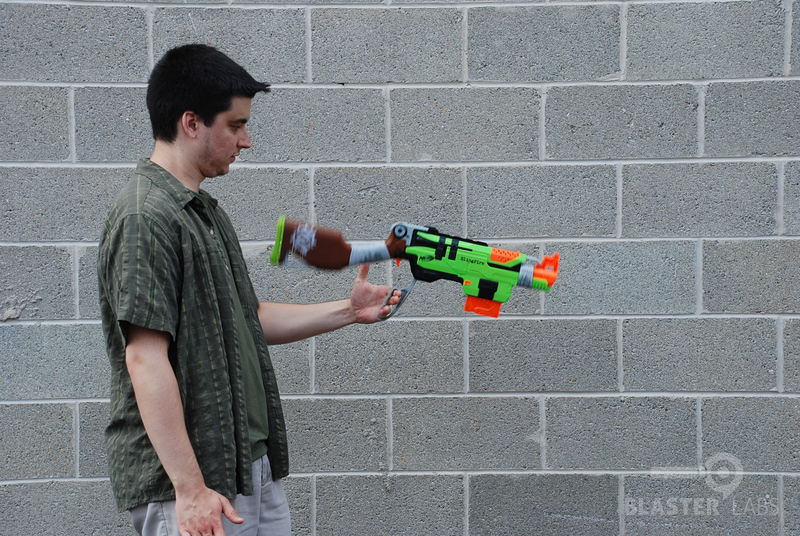 When it comes to just having fun, the Slingfire is not to be missed. 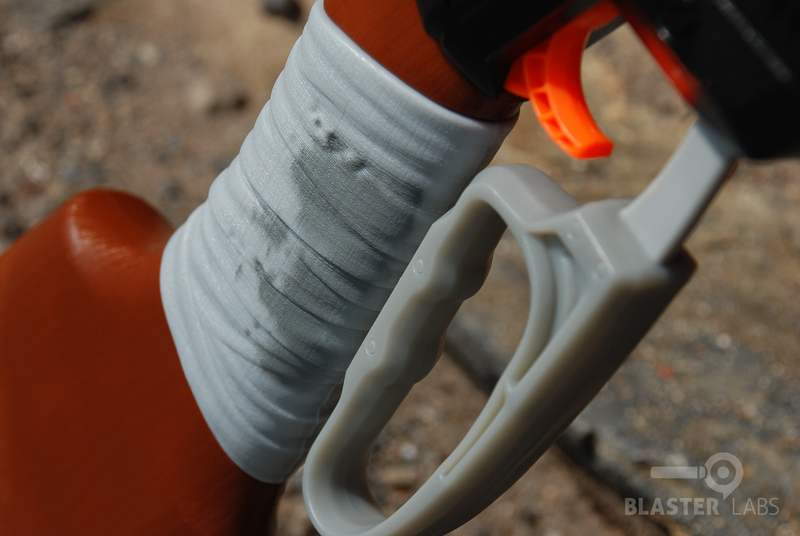 The lever-action priming is a rewarding challenge that looks awesome when pulled-off correctly. We have no doubt the more talented gun-slingers among us will be posting some impressive Slingfire YouTube videos in no time at all. If you get a chance, try it out for yourself. It’s not exactly the fastest way to pull off a shot, but it’s absolutely the most stylish and it’s a much more visceral way to experience the joy of foam blasting than just pulling the trigger of a battery-powered model. This leaves us with a bit of a conundrum. 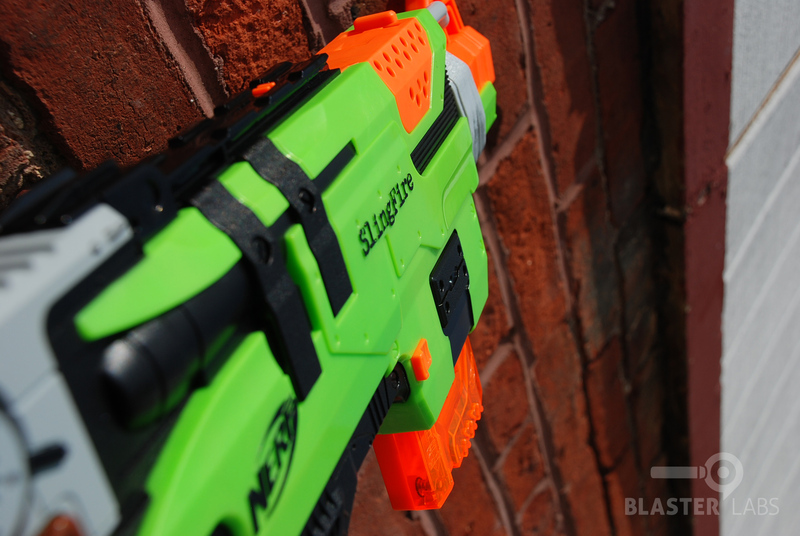 The Slingfire is likely the most sought-after new Nerf product to arrive on store shelves in months–easily the equal of the Demolisher in terms of fan anticipation. And first impressions are good: it’s packaged well, looks amazing, and feels great in-hand. Yet, its actual performance is somewhat disappointingly average. So how do we judge the value of a product that delivers so highly in some areas, but leaves us flat in others? Well, for those who want the best-looking, well-built, and fun-to-use blaster for the money, we can easily recommend the Slingfire. But for those who are thinking the Slingfire might be a fun addition to their load-out on game day, we might suggest giving that a second thought. For everyone else without tightly defined needs or specific use requirements, you just might want to give the Slingfire a shot–it’s perhaps the best argument yet for style over substance. This entry was posted in Dart Blasters, Reviews and tagged nerf, review, Slingfire, zombie strike on July 2, 2014 by PMindemann. I have one, and I love it. Now, while the range is listed as “average” and that’s a con, I have to say that for the price range, and considering it’s practically double that of my AR deleted and air release hole plugged Longshots, (although they might have problems) I love it. Besides, what do you expect for a gun this nice yet this cheap? Sure, they should have had a larger mag, like the Retaliator 12 rounder, but that’s how they’re keeping prices low. The problems I have is that the mag doesn’t seem to hold the rounds. They just shoot out of it. Might be a problem for just me, though. Otherwise, the terrible fake hand wrapping is VERY uncomfortable, and I had to hammer it off with a hammer, chisel and good sized flathead screwdriver. First thing after I get the paint off the stock will be to re-wrap it with some scrap leather. my friend as one and he is incredibly accurate with it. This just happened to my son’s that he got today. It appears that the pawl (little lever that clicks into the ratchet) has a squared end, and so the action isn’t always smooth and it can bind up. It took about 5 minutes to take it apart and unbind it… it wasn’t hard. I think it’s just a case of it needing to ‘break in’ some. Don’t give up on it yet, my son still loves it. I took a picture to show you… the red arrow points to what was bound up. We’ll see if it happens again… but maybe a quick fix like it was for me. We’ve got a couple at my uni Humans vs Zombies group. Both of them managed to get magazines stuck in them in one game session, requiring some serious work with various tools. They’re pretty fun, but I just find the reliability way too low to use seriously. I think this review needs an update. 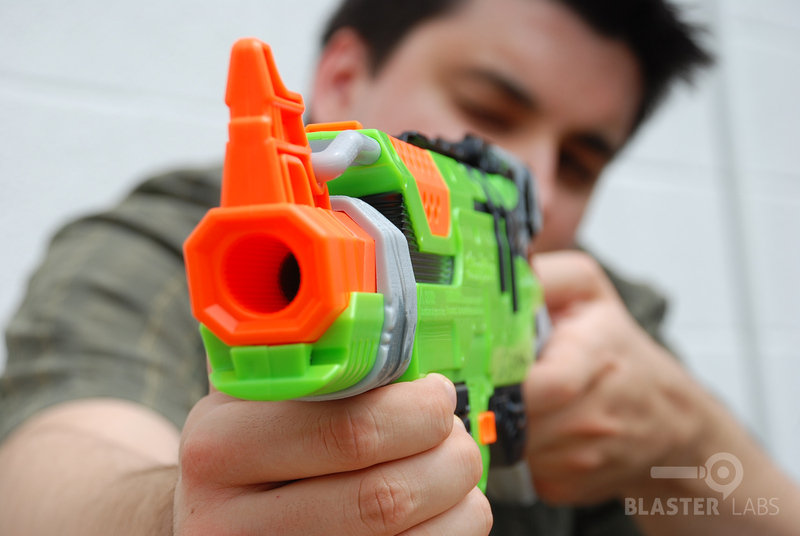 The original (green breech) models of this blaster had performance issues that were resolved with the later models which have a black breech. You can see in the images that blasterlabs was testing an earlier model, the crappy one with the green breech. I’d love to see some chrono’s and range testing done on the newer black breech model of the Slingfire. I own a black-breeched one and I believe that the Slingfire’s performance is actually on par with other elite blasters such as the Retaliator… However it is being rated lower than it deserves, due to this review and many other preliminary reports about it’s lack of performance. 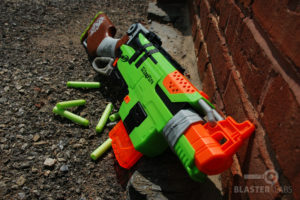 Subsequently the general consensus of the Slingfire is that it does not perform as well as what we’ve come to expect from Elite blasters… however, this may be false because everyone was testing the early (green breech) models. We’ve heard about the improved version, and agree an update would be good. 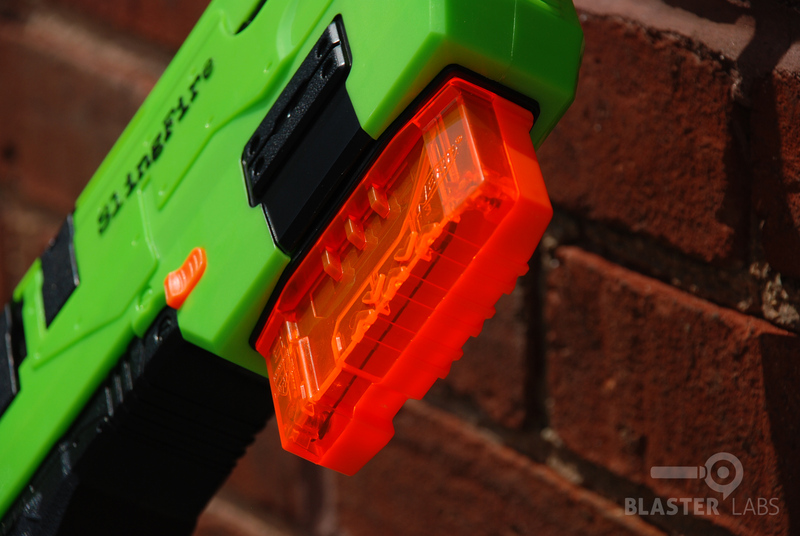 However, this is not atypical of Nerf products… the Centurion is the most well-known example of a product that was released to the public with issues, only to be improved in later iterations. 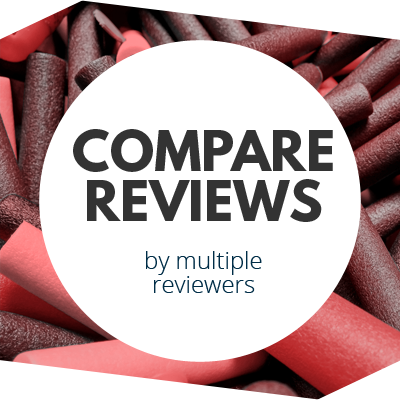 Unfortunately, the general public has no way of knowing which version they are purchasing, so doing a review of the “worst” of all possible models is our preference (in the hopes consumers would get a product that does at least as well–if not better–than what we found in our testing). We also feel not picking a “best case” sample is one way we can encourage Hasbro to more thoroughly test their products before bringing them to market… no company wants a bad product review, so if their initial products aren’t up to par from the start, they run the risk of us reporting that and creating long-term sales damage.